The water level of Lake Urmia in the East Azerbaijan Province of Iran has increased by 45 centimeters compared to the same period last Iranian year (started March 21, 2018), Khalil Saei, head of the provincial committee for the restoration of Lake Urmia said, Trend reports via IRNA. He said that the water level of the lake is still on the rise. He noted that the water level increased by 9 centimeters compared to last week, adding that rains increase hopes for restoration of Lake Urmia. “At present, the water balance of the Lake Urmia is 1,271 meters and 19 centimeters, however, it was 1,270 meters and 74 centimeters in the same period last year,” he said. There are 3.13 million cubic meters of water in Lake Urmia, he noted. The volume of water in the same period last year was 1.99 million cubic meters, he added. 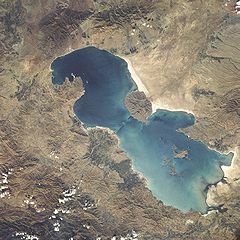 The current water area of​​ Lake Urmia is 2.741 million square kilometers, while the water area was ​​2.276 million square kilometers in the same period last year, he said.